Beautifully restored 2 storey farmhouse. Private gardens offering maximum comfort and tranquility . Master bedroom en suite, two twin rooms , bath in main bathroom. Microwave,hairdryer, stair gate, dishwasher, Washer/dryer, oil fired central heating and two open fires. Television and DVD player. Linen and towels supplied. Utilities by meter read. Travel cot on request. Welcome pack on arrival. Internet is available on request please ask for details when booking . Perfect family spot in the Irish countryside! With two city kids, 5 & 7, this was the perfect place to get away from the bustle and soak in the Irish countryside. Theresa and Kevin were so welcoming and accommodating - thanks for the homemade muffins and Irish Coffees! And John and May at the neighboring farm could not have been sweeter, introducing our girls to Bess, the donkey. The accommodations are spacious and full of charm, and having two bathrooms (with two showers) definitely helped us get out on the road early to see the sights. We loved the location, because it’s truly in the country, but still a very convenient base camp to see all the great spots in the West and the south. Don’t expect the typical touristy leprechauns, shamrocks, and tourist-crammed pubs here. This is the real countryside with all it’s lovely, friendly locals, twisting narrow lanes, and emerald-green, patchwork hills. We hope to return someday! We had a wonderful stay! Theresa and Kevin are amazing. Very hospitable and helpful. We look forward to visiting again. This home is well maintained and offers very comfortable accommodations. Wood floors, antique furniture and lots of character to this house. Truly tranquil if you want to experience the Irish countryside or getaway from the city for a few days. You'll need a car as most of the villages are a distance from each other and the house. Some interesting ruins in Askeaton, and a pub in Glin that served great soup. It is 30-35 minutes from Limerick and Bunratty Castle (the castle is well worth the visit), and 20-25 minutes to Adare. Adare is a tiny village so it will not take much time to walk about but has excellent pubs and restaurants, so also worth the visit. Theresa kindly waited for us after we got somewhat lost on the Wild Atlantic Way - now that's an interesting ride! Highly recommend driving some of it, but we were unprepared for the narrowness of the roads and two-way traffic! Communicating with Theresa was easy and she was helpful about orienting us to the house. Have to give a shout-out to the local gas station employees who went out of their way to help us locate the house when we got lost. The Stand, the local pub/restaurant is a 5 minute drive from the house.and serves good food. Very pretty area! Had a really good time and the house suited us really well. Lovely scones available to welcome us and the owners are lovely friendly people. Great place to base yourself to journey around the bottom of Ireland. Car is very necessary. Theresa was so responsive to every question. The house was exactly what we needed to see true Irish countryside and we were happy to not be stuck in Dublin. Shanagolden is beautiful. Thanks for your positive review .It was so lovely to meet you and your family I am so glad you all enjoyed your stay. You will have to come back some day for a longer stay , we would would love to welcome you back anytime. The friendly owner met us at the local pub "The Old Stand" and took us to the house. House tricky to find if your just using a tourist map. We stayed 3 days in the area and visited the Foynes Flying Boat Museum. Museum explains a little known part of Irish Aviation history, it is well presented, plan for 2 hours with kids + shop for the "Irish Coffee". Comfortable house with all wooden floors. We used the fireplace for a cosy evening in out of the rain. Plenty of room for 6 persons or for a family with 4 kids. 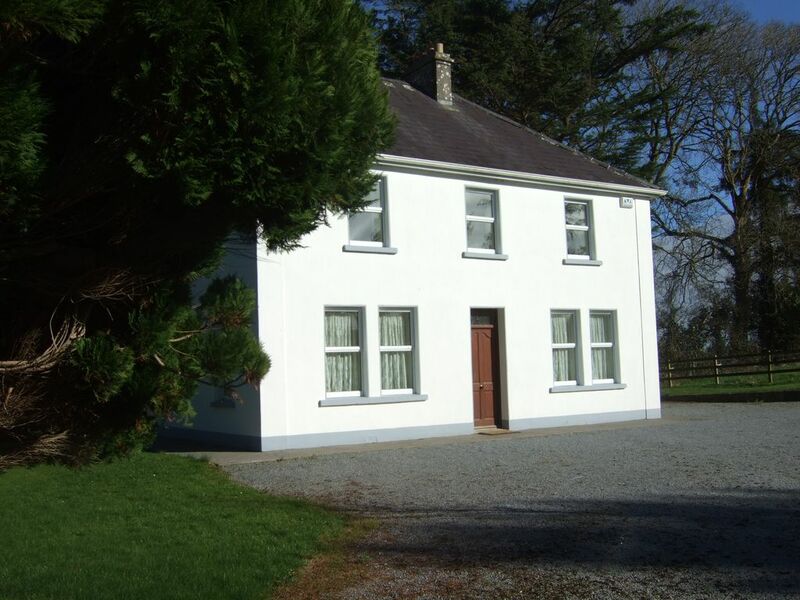 Quiet getaway, surrounded by nice trees with a view over the West Limerick hills. Well situated for days trips around Limerick county, West Clare and North Kerry (Tralee/Dingle). Glad ye enjoyed your stay. It was lovely to meet you and your family and I must say ye were the perfect guests. Hopefully we can welcome you back again in the future and we will do our best to have the cows grazing in the nearby field. Sporting Lodge is a beautifully restored farmhouse ideally located for exploring Limerick, Clare and Kerry. Private gardens offering maximum comfort and tranquility. Golfing, Angling, Swimming, Horse-riding, paint Balling, Go- Karting, yacht Club & walks all nearby. Enjoy a visit to Foynes Boat Museum, or spend some time in Adare 'Ireland's Prettiest Village'. A trip to Curragh Chase Forest Park' 300 hectares of mixed woodland and parkland, is a must with its many marked walks, playground ,historic House, lake and specimen trees. Nearby the Medieval town of Askeaton with its impressive Abbey and Castle is also worth a visit. Take a trip to Limerick city, a modern riverside city where you can visit King John's Castle, the Hunt museum,Thomond Park Stadium, home to the Munster Rugby Team or take time out in one of its many fine restaurants or cafes .Limerick also offers a great shopping experience both in the city centre and its many shopping centres. Many have enjoyed the banquet at Bunratty Castle or the ferry to Clare to visit Kilkee Seaside resort, Cliffs of Moher or Ailwee Caves in the Burren National Park. The location of this premises allows you to explore a different county every day.